Posted on November 4, 2011	by Cat Q. Well, I’m online. The internet hasn’t been very consistent over the past month so I haven’t even really attempted to get online. It’s usually just enough of a connection to login to yahoo but not enough to actually check my email. Fun fun. But it’s back now! And the DoE (dept of education) has started unblocking facebook after school so I can get on FB again! At Maxine’s for my birthday feast! October was a whirlwind. I turned 28 on the 7th. Columbus Day fell on my birthday this year, so we had a big assembly and were let out of school early that Friday for the three-day weekend. 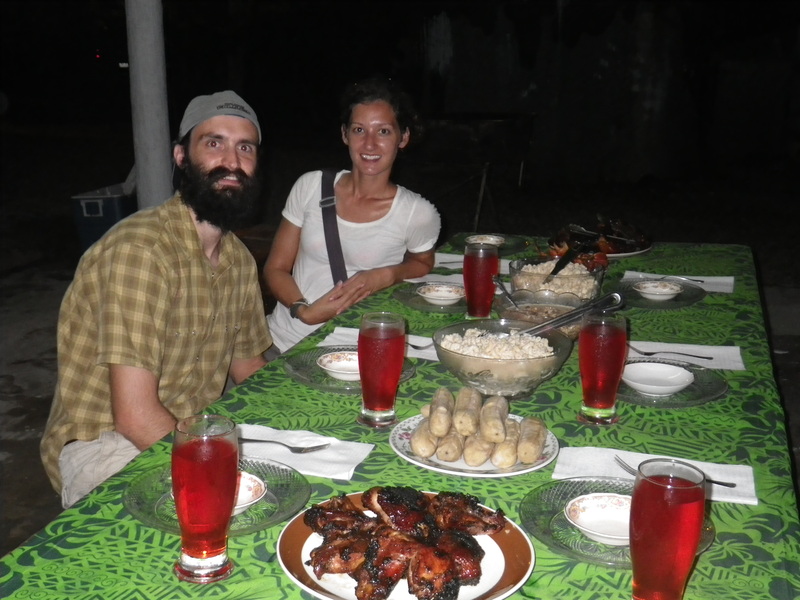 One of the other volunteers, Erin, planned a fantastic surprise party for me in Ta’u at one of our Samoan friend’s house. They put together a really elaborate dinner and served all of my favorite Samoan foods, cake and icecream (what a luxury!) and topped it all of with a bonfire on the beach! It was the best birthday I’ve had in years. Oh gosh. The cuteness is almost too much to handle. 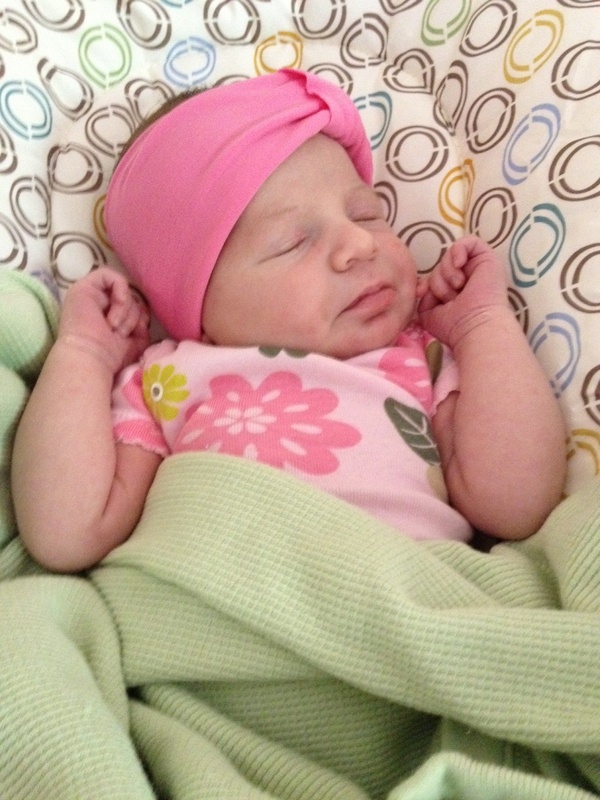 The very next day, my best friend, Jessica, gave birth to her first daughter. Talk about an awesome birthday present. I got to talk to Jessica on Friday afternoon and she casually mentioned as we were getting off the phone that her husband thought she was in labor but she totally thought it was a false alarm. A few hours later she called me to tell me they were on their way to the hospital, haha. Even though she did not have E on the 7th in any time zone, I’ll always think of her as a birthday baby. I love her so much! 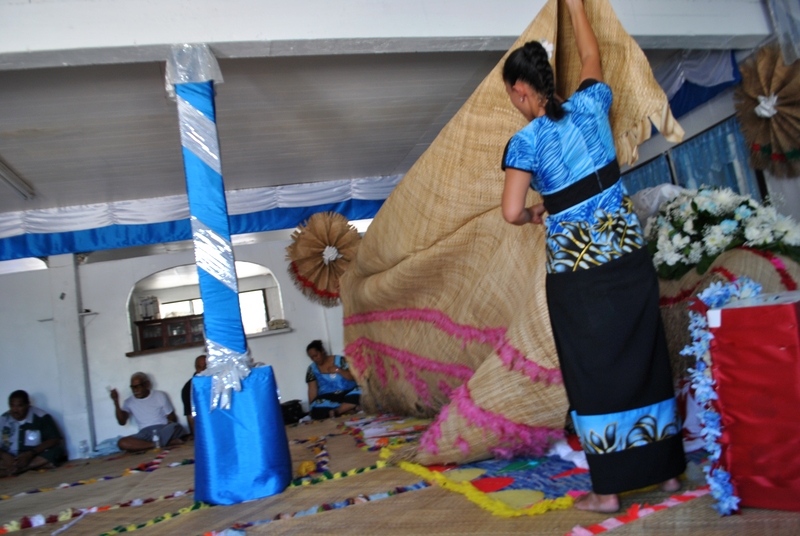 Sunday the 9th was White Sunday, or Lotu Tamaiti, which is a huge church event for the children. 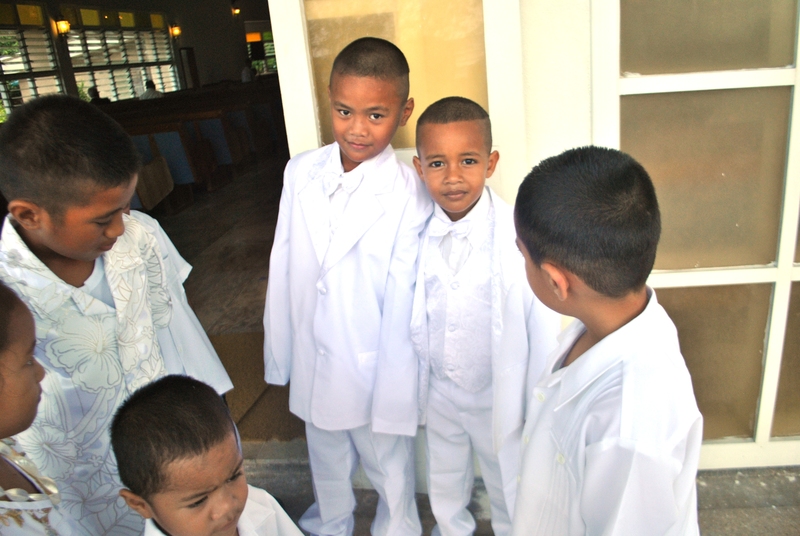 All of the children dress in white and conduct services for the church. 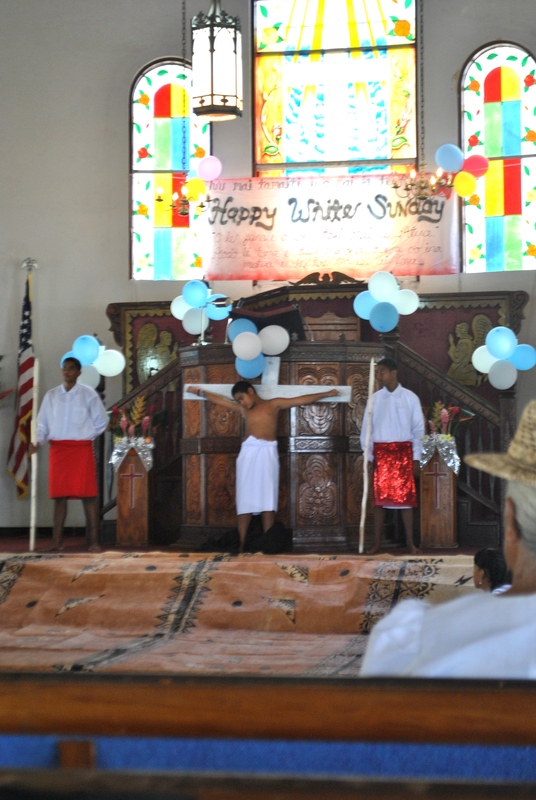 They give the sermons, collect the offering, lead communion, and perform skits. It was adorable. 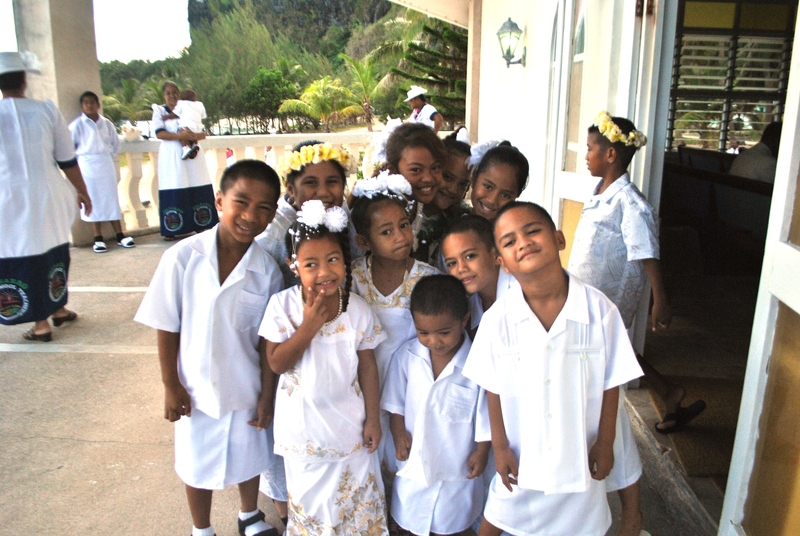 Only two of my students live in Faleasao, so I wasn’t able to see all of my kids sing their songs, but the Ta’u kids were more than happy to show off their memory verses and songs at school the Friday before. 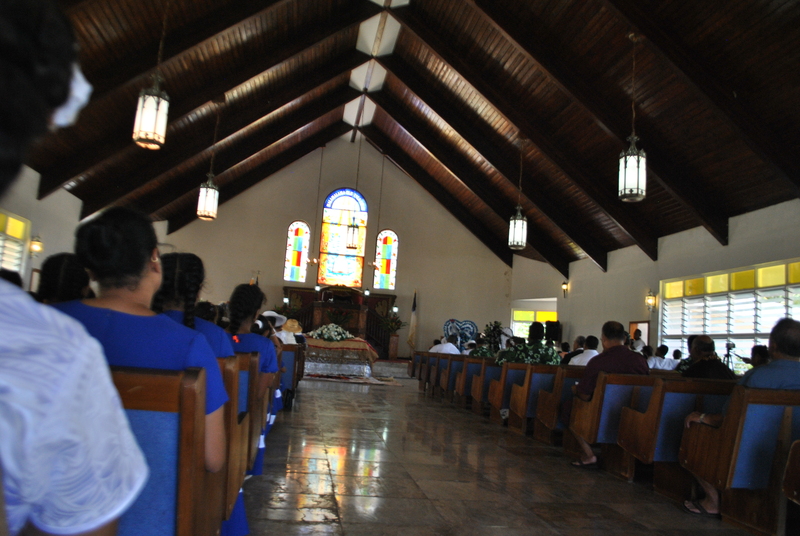 The funeral for our vice principal was held on October 14th. 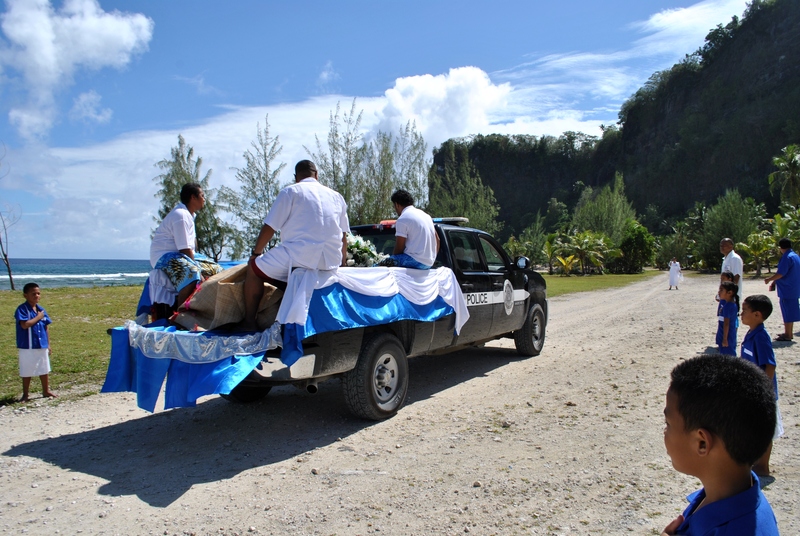 Funerals are a big deal here, and since Satia was a Matai (a title in the chief system of Samoa), his funeral was an all-day, whole-village activity. The day before the funeral, classes ended early so the elementary students could pick up trash and along the road. 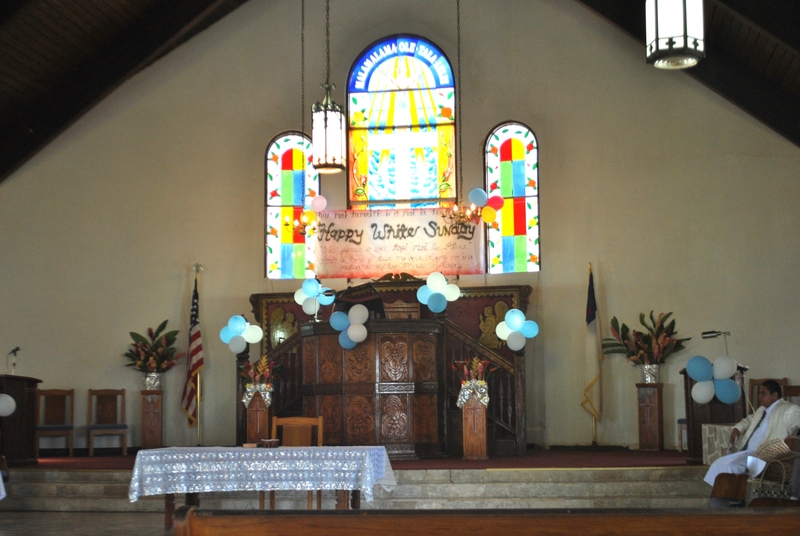 We also hung blue and white ribbon on all the trees between the wharf (where his body would arrive on the boat) and the church. We did not have school on the day of the funeral. The elementary teachers met the family at the wharf first thing that morning. 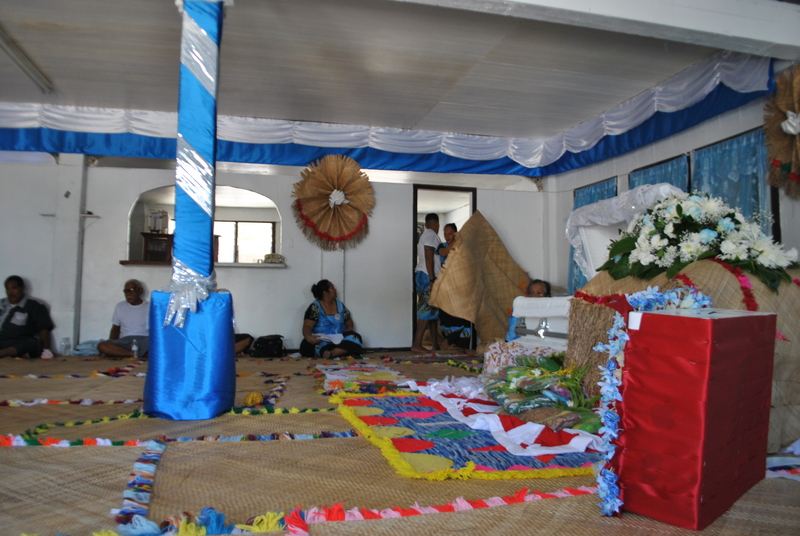 A small ceremony was held during which the family met and decided which ‘ie toga would be chosen to cover the casket. It was about 6:30 in the morning and it was already oppressively hot. 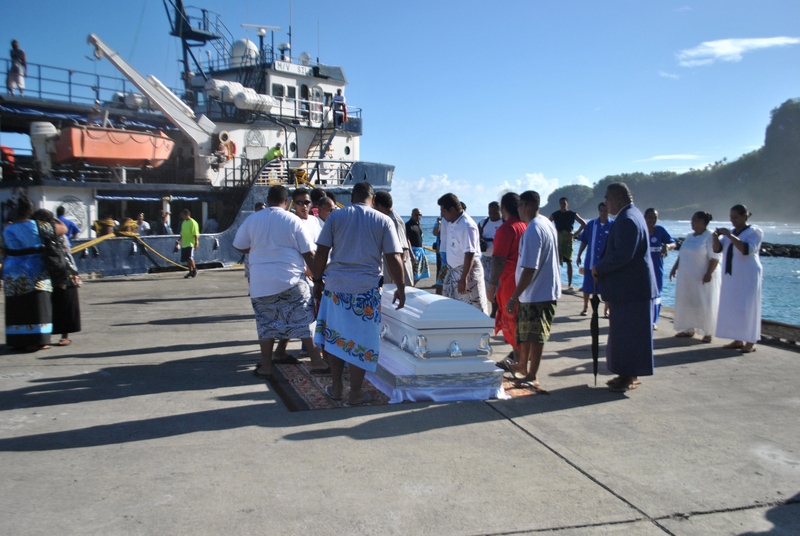 The wharf ceremony began when the casket was carried out of the boat. 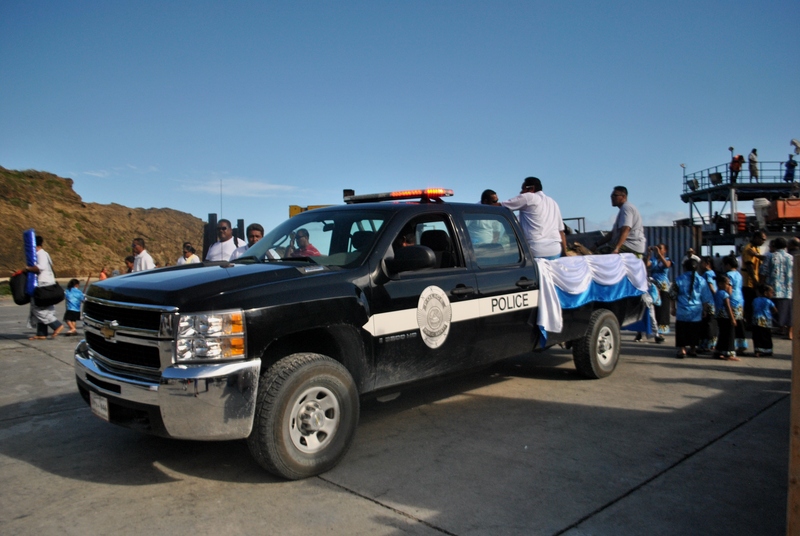 Loading the casket into the back of the island’s lone police truck. 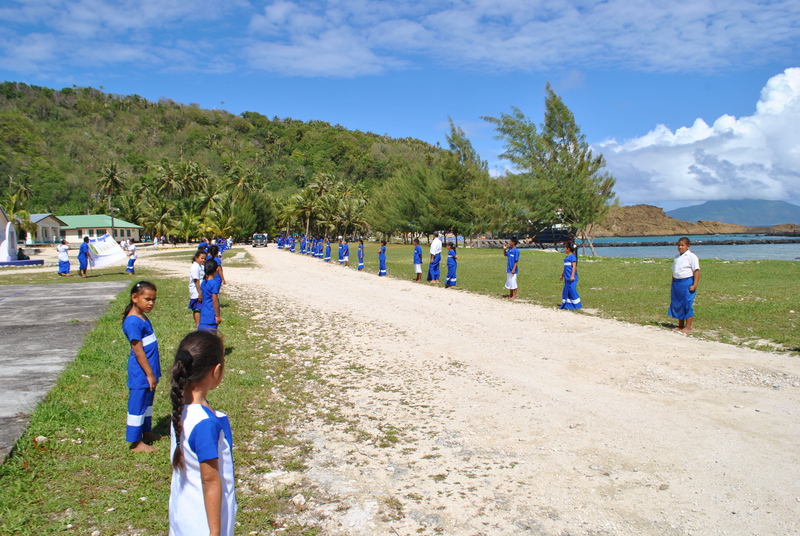 The students then lined up along the road between the wharf and the church to welcome Satia’s family home and show their support. Then we went for the Christian funeral in the church. It was a very long, very moving service (despite my limited knowledge of Samoan). Members of the family, friends, and colleagues were all invited to speak and sing songs. The elementary school sang three songs (one at the front of the church…imagine trying to sing a song in front of 200ish people in a language you don’t know!). After the church service, we were given breakfast and the kids went home. 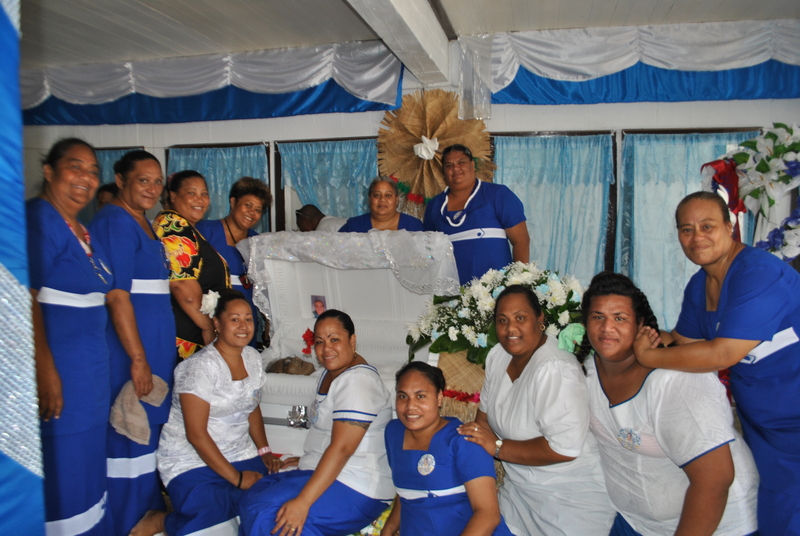 Then the teachers went to the Samoan funeral at Satia’s family’s house. It was a real honor to be able to attend. We presented cloth and flowers at the casket, then sat inside the main room of the home (the casket had been moved from the church to the house). Our eldest male teacher spoke (in Samoan so I’m not sure what all was said) to the Matia of the family and explained the gifts we brought. 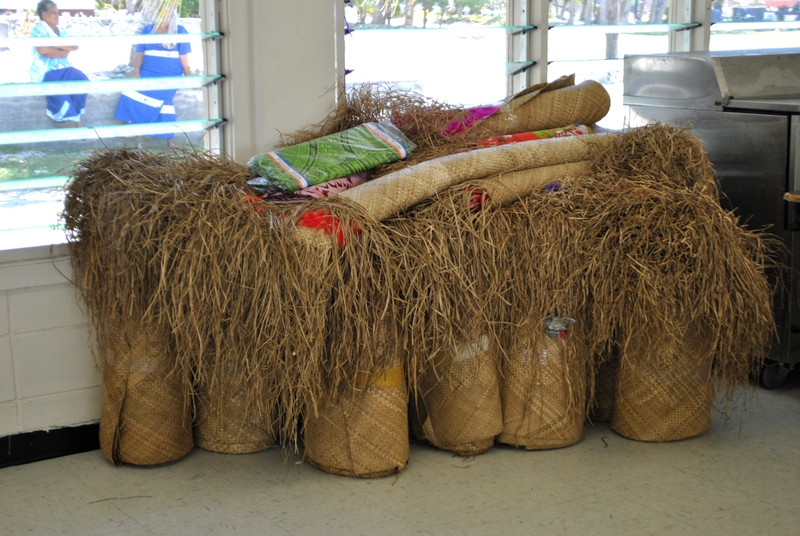 In addition to the fabric, the elementary staff gave $1000 and several ietoga (fine mats). 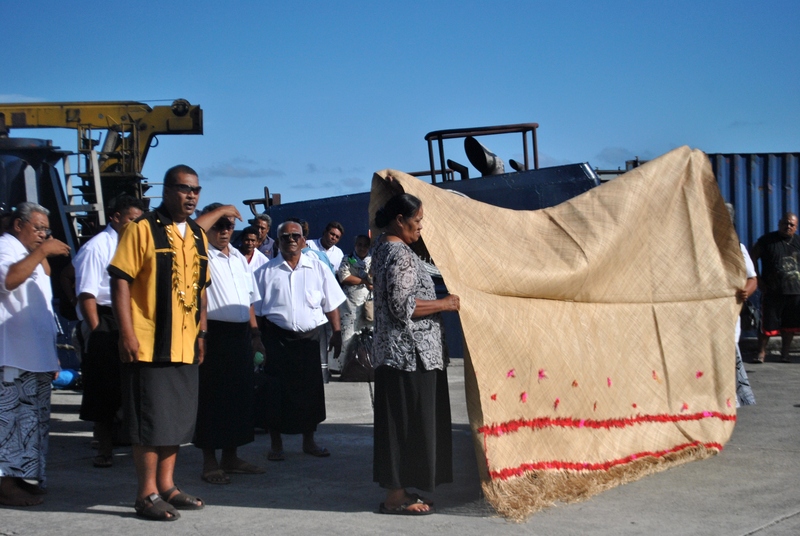 The mats were presented and accepted by the family. Then the family spoke and gave gifts of appreciation to the staff. We left the family’s house and returned to the elementary school with a truck full of gifts. Everything was split up among the teachers. I received a box of frozen chicken, a case (24 cans!) of mackerel, and 6lbs of beef!!! The family also provided each teacher with dinner. Remember how I told you that Samoan serving sizes are huge? This is one serving of food. 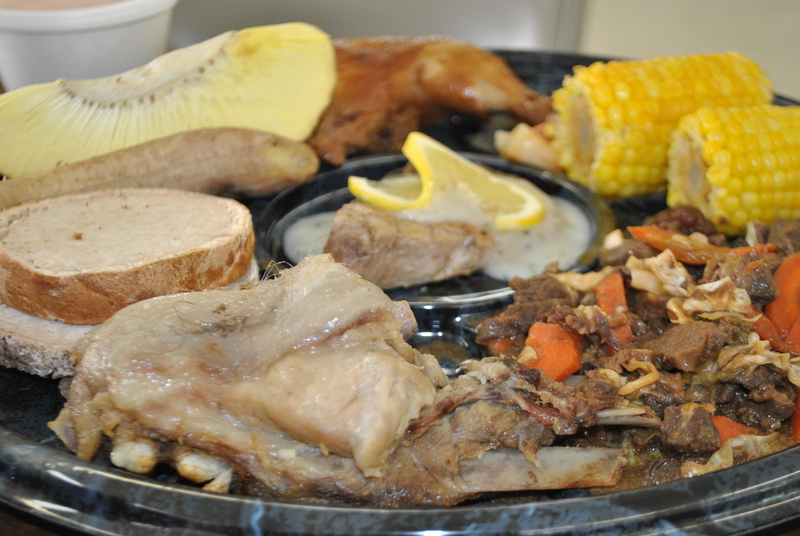 Please notice the hair on that slab of pork. Yum yum! October was also the month of the palolo–weird little worms that only surface seven days after the first full moon in October (and sometimes in November). 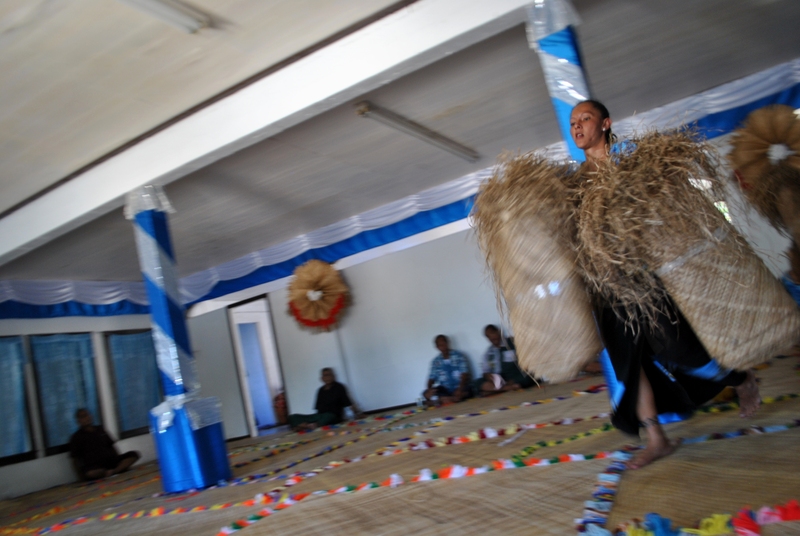 The whole village gathers late into the night with flashlights and nets to catch the palolo. We completely missed it but we’re hoping for next month. Our WorldTeach Field Director was here that week for our classroom observations, and the night the palolo came out (shortly after 1:30am) was the night before he was going to be in my classroom so I very responsibly went to bed and may have missed the experience of a lifetime. Just imagine standing waist/chest-deep in the ocean at night and suddenly finding yourself completely engulfed in a sea of worms. Erin was the only one of us who stayed on the beach long enough to experience it. Erin ate one, too, because she’s brave as all get out. Apparently it just tastes like sea water. One bucket of palolo sells for $50 here. They are a pretty big deal. Last week we had spirit week at school. Spirit week is pretty different here. For one, there are no sports teams at any of the schools on our island. Instead of theme days, the students are just asked to dress in solid colors. Monday was white, Tuesday yellow, Wednesday black, and Thursday was orange. But Friday…Friday was opposite day. 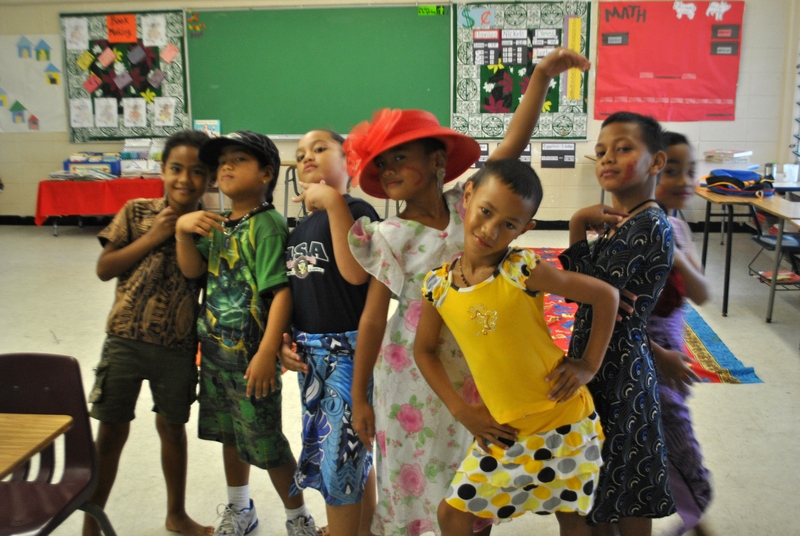 All the boys, from kindergarten to 8th grade, dressed as girls. Of course, the girls dressing up as guys was nowhere near as funny, but had a good time. 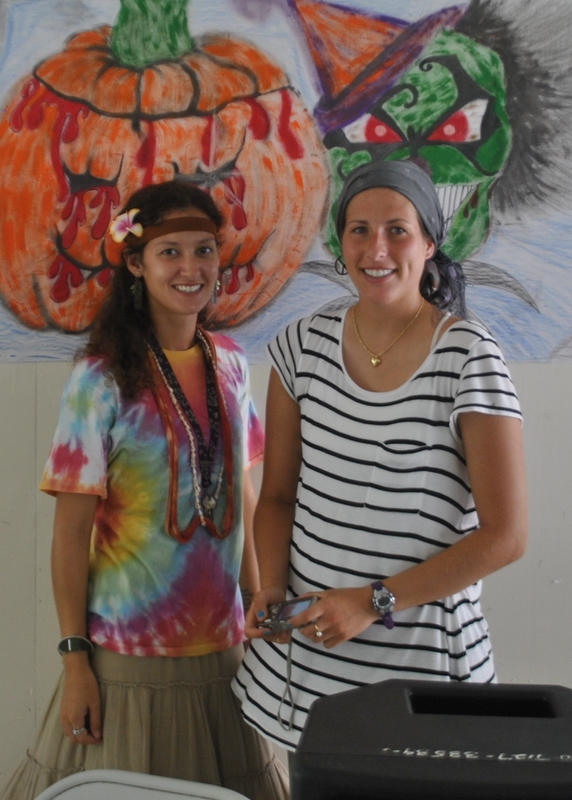 We had an assembly on Friday where we played typical fall-festival games. Teachers always do these games too after all the students have finished. One of the games was a little relay race thing where you run across the cafeteria (like 12 ft, haha), chug a soda, and race back. I ended up having to chug a Mountain Dew and couldn’t handle it. 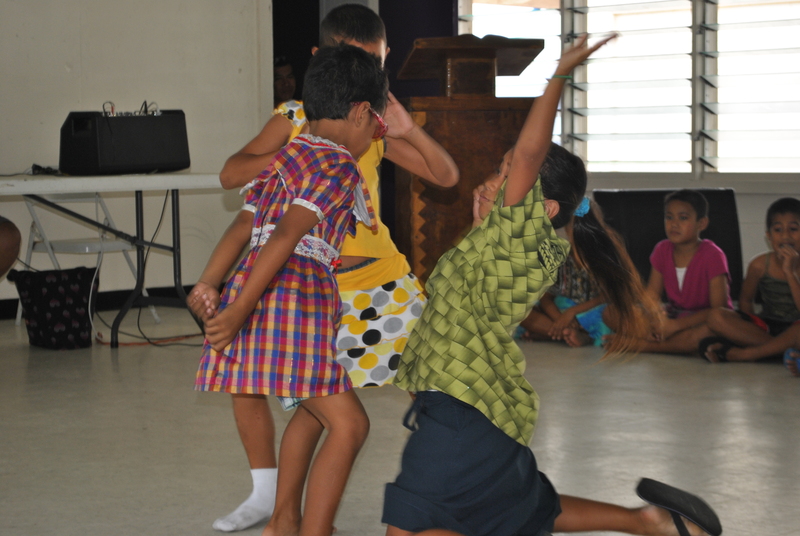 L2, L1, and K5 students in a dance-off. You can see how violently and inappropriately they dance, haha. For Halloween, the kids dressed in costumes and we had yet another assembly that afternoon. There was a costume competition (eh hem, I won “prettiest” for the teacher costume category…kinda sweet of the kids to flatter an old lady) and lots of dancing. My perfect little nephew, Gabe! 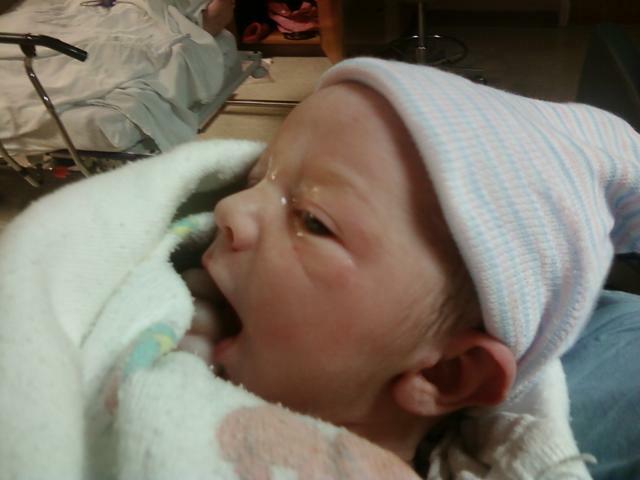 Finally, to top off an amazing month, I became an aunt! My little brother and his wife welcomed their perfect little son into the world. He was born on November 1st in the States, but it was still Halloween here. I’ve seen lots of pictures of him already and he’s so stinkin’ cute it hurts. My mom skyped with my brother during the delivery, and when she called me I was able to talk to Chris over my mom’s cellphone over skype. Technology is fantastic. Wes recently posted about the boat and the plane not coming to the island. The governor of A.S. (from what we hear) contacted the Coast Guard and the boat is now back on schedule. It came this morning!!! Thank you Jessica and Aunt Rhonda for the packages! You guys are swell. I know this post is absurdly long so thanks for reading. I hope the internet will stick around so I’ll be able to update more often. This entry was posted in American Samoa and tagged Becoming an aunt, birthday, fa'alavelave, fa'asamoa, palolo, Samoan funeral, spirit fest. Bookmark the permalink. Yo girl. Thanks for the update! So, with Jessica’s baby. If she feeds it a water stone will she turn into a Vaporeon? Just wanted to know. Well first off congrats on being an Auntie! Glad you had a great birthday too! I am a fan of skits so that must have been fun to watch your kids. I’d of loved that Thursday by the way! And I love how you said “please notice the hair” in that one picture of the pork, ha ha. Not to mention I can’t believe those worms; oh sorry, Palolo, can have a bucket be worth $50! I totally would have stayed up! but you were responsible to go beddy by =^) so I can’t poke fun. Miss you and send my love and prayers to ya’ll! P.S, very glad the boat is back in business and that ya’lls internet is good to go because I love reading ya’lls posts!! Can somebody please tell me what a Vaporeon is so I don’t have to google? Kthxbye. I’m assuming it has something to do with Pokemon. Maybe there’s an Evie in the game? Idk! you were totally right about the pokemon thing. and vaporeons are ugly so i am offended.